Julia Biryukova, mother of two-year-old Sky Metawala who vanished after being left in an unlocked car while she went to get gas, had previously been cited for leaving a child unattended in a vehicle, according to police. 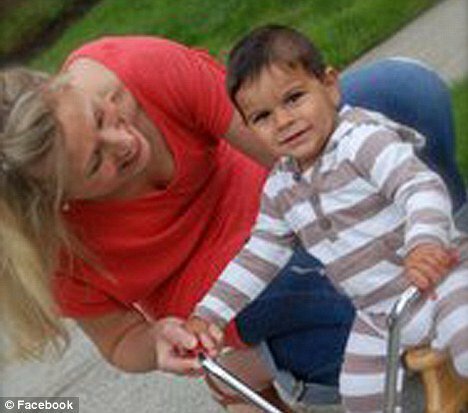 Authorities of Bellevue, Washington, spent a second day today searching for Sky Metawala, as court documents emerged revealing his parents had previously been arrested for leaving their child. The mother had also obtained a restraining order against his father last year. Julia Biryukova told investigators she left her toddler alone on Sunday as she and her four-year-old daughter walked a mile to a gas station, Bellevue police said. When she came back an hour later, the boy was gone, Julia Biryukova said. Investigators searched a 20-block area and even went door to door but found no sign of him. In December 2009, officers in nearby Redmond cited Julia Biryukova and her husband, Solomon Metalwala, for reckless endangerment for leaving a child unattended in a vehicle. Details were not immediately available; police said they were working to redact an incident report for release under the state’s public records act. The case was dismissed early this year after Sky Metawala’s parents agreed to a year of probation, 40 hours of community service and a ten-week parenting class, said Ian Goodhew, a spokesman for the King County Prosecutor’s Office. Julia Biryukova and Solomon Metalwala had been together for 14 years, married since 2003 and separated in March 2010, court records show. In June 2010, Julia Biryukova, 30, filed for a protection order on behalf of herself and their two children, saying Solomon Metalwala had a severe anger problem, was verbally abusive and that he had beat her for the first time the previous Christmas. The reason was that she had allowed Sky – just four months old at the time – to sleep later than expected, Julia Biryukova said. “He became furious like I have never seen him before, he grabbed me by my hair in front of our daughter, dragged me into our hallway, threw me down on the floor and then threw me against a decorative column we have in the entrance of our home,” Julia Biryukova wrote. The abuse escalated after that, with Solomon Metalwala telling her to go live on the street and work as a prostitute, Julia Biryukova said. “The most, most recent have been his threats to kill me if I say anything against him or if in any way I proceed with action of seeking custody of our two small children,” Julia Biryukova added. A man who answered the phone at King Street Kafe and Market, a shop Solomon Metalwala owns in Seattle’s Pioneer Square neighborhood, referred calls to a Leslie Clay Terry III, a lawyer who represented the couple in the reckless endangerment case. Clay Terry did not immediately return a call seeking comment. Julia Biryukova told police that as she was walking back to her silver Acura from Chevron gas station a friend picked her up and drove them back to the car. But when they returned, the toddler was missing. The door had been left unlocked and there was no sign of forced entry, police said. Sky Metalwala has been described as having brown eyes and dark buzz-cut hair. The toddler was dressed in a dark-green hooded sweatshirt and blue and grey striped trousers. The case is being treated as a missing child, as they do not know if he was taken or left on his own accord.